The harmonium or known as 'pump organ' is a kind of free-reed organ. It generates its sound as air flows past a vibrating a reed. This is done by pumping two foot pedals. The harmonium is a simple instrument, it is limited in volume and tonal range, but has a strong organic organ character. The harmonium we have recorded was located in an old 'Jugendstil' fashioned Grand Hotel in heart of the Switzerland alpes. It was manufactured by 'Mannborg', an old German company from the 19th century. Unfortunately the harmonium wasn´t in a perfect condition - detuned notes and bad working reeds - but this couldn't prevent us from capturing this old charming organic organ. This is the instrument rack view where you can set and determine lots of options. Organic manipulates the mid-range EQ section and opens the dry/wet values of a multiband compression. This highlights the performance noises produced when playing the pump system of the Harmonium. Bass controls the low end EQ and rices the low dynamics of the compressor. This enables a layer which is tuned one octave down which create a deeper sound. Reverb controls the dry/wet and decay time parameters of the overall reverb. 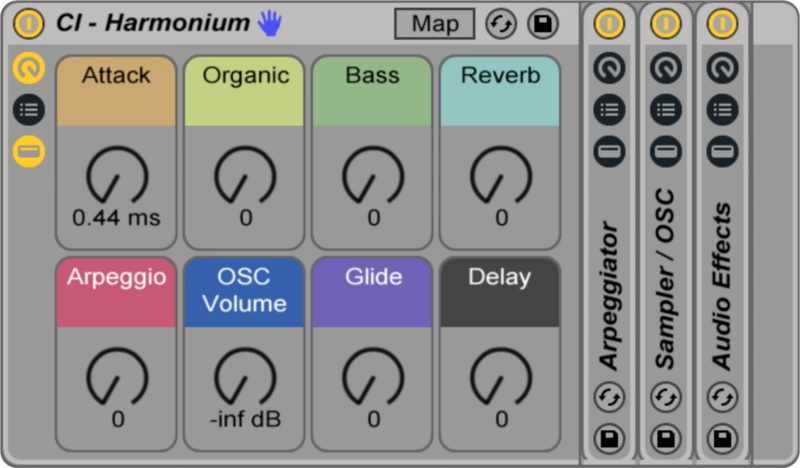 Arpeggio enables and disables the Arpeggiator module. OSC Volume controls the overall volume of the samplers’ oscillator. Glide manipulates the glide type and glide time parameters of the Sampler. Delay manipulates the Dry/Wet and Feedback amount of the overall delay. For more details please read the manual. Ableton Suite version 9.7 is required.